Sharks are apex predators, the “top dogs” of the marine world. They have a reputation as bloodthirsty killing machines, but this view is distorted. Sharks are not unique in consuming animals. For example, humans are predators, eating cattle, pigs, chickens, fish, and other creatures. As apex predators, sharks limit the populations of the animals they eat. This maintains the balance of nature. Sharks occasionally do bite humans, but not all bites are feeding events. Sharks sometimes grab humans by mistake. 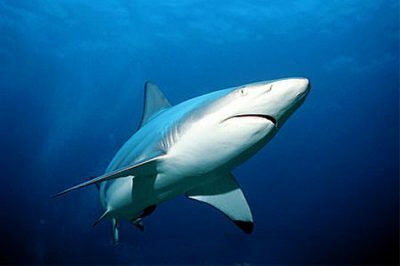 Other times an attack may protect a shark’s space, much as a dog barks at and bites intruders. The yearly average of unprovoked shark attacks on humans is 80, resulting in about 6 deaths. These worldwide numbers are small given the millions of humans that enter the water. You have a better chance of dying from a bee sting, a dog or snake bite, or lightning than from a shark attack. 1. Always swim in a group. Sharks most often attack lone individuals. 2. Don’t wander too far from shore. Doing so isolates you and places you away from assistance. 3. Avoid the water at night, dawn, or dusk. 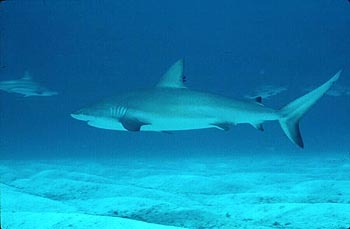 Many sharks are most active at these times and are better able to find you than you are to see them. 4. Don’t enter the water if bleeding. Sharks can smell and taste blood, and trace it back to its source. 5. Don’t wear shiny jewelry. The reflected light looks like shining fish scales. 6. Don’t go into waters containing sewage. Sewage attracts bait fishes, which in turn attract sharks. 7. Avoid waters being fished and those with lots of bait fishes. Diving seabirds are good indicators of such activities. 8. Don’t enter the water if sharks are present. Leave immediately if sharks are seen. 9. Avoid an uneven tan and brightly colored clothing. Sharks see contrast particularly well, so use extra caution when waters are cloudy. 10. Don’t splash a lot. Also, keep pets out of the water. Erratic movements can attract sharks. 11. Use care near sandbars or steep drop-offs. These are favorite hangouts for sharks. 12. Don’t relax just because porpoises are nearby. Sightings of porpoises do not indicate the absence of sharks. Both often eat the same foods. 13. Don’t try to touch a shark if you see one! 14. If attacked by a shark, the general rule is “Do whatever it takes to get away!” Some people have successfully chosen to be aggressive, others passive. Some yelled underwater, others blew bubbles. Provoked attacks are caused by humans touching sharks. Often this involves unhooking sharks or removing them from fishing nets. However, recently there have been a number of incidents involving divers who were attacked after grabbing or feeding a shark while underwater. Unprovoked attacks happen when sharks make the first contact. This can take three forms. Although sharks rarely kill humans, humans are killing about 20 to 30 million sharks per year through commercial and sport fishing. Sharks are blessed with outstanding senses of smell, taste, hearing, and sight; the ability to detect minute changes in water pressure and electromagnetic fields; and other attributes that make them nearly invincible in the sea. Yet they are quite vulnerable to a baited hook and are easily caught. In many areas of the world sharks are becoming seriously overfished and some species are seriously threatened. More and more people understand that sharks are a valuable part of the ocean environment and must be protected. Fishery management plans have been developed in many areas, but similar action is needed in many other regions. Certain species, such as the white, sand tiger, whale, and basking sharks, have received special governmental protection in some countries.